Fuu has been on my dream cosplay list since I saw Magic Knight Rayearth. I loved her character and felt that I could relate to her. One day last winter I decided that I needed to get a MKR group organized to showcase my love for it. I managed to get my friend Jen to be Hikaru and my cosplay friend Bandit Spurs to be Umi. We debuted our group at Otakuthon 2015 and it was a huge hit! Turns out there is a lot of love for old anime! Top - I made Fuu's top using the same method that I used for Hikaru's. 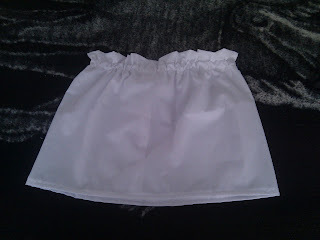 It was a simple loose tube of white fabric with an elastic at the top and some excess fabric for the built in ruffle. The long flowy panels were sewn onto the back of the top; there were four in total were made from a light chiffon. Cincher - I decided to make her cincher out of fabric and interfacing. 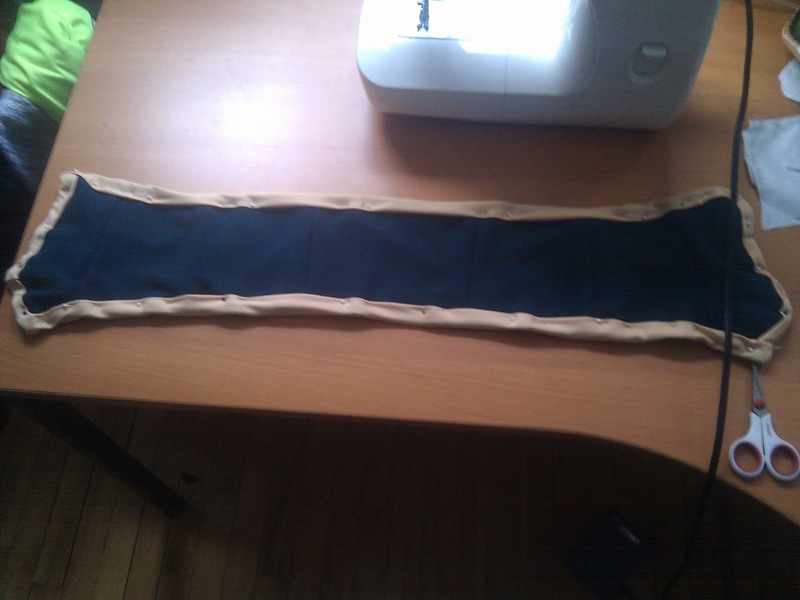 I used a "soft" corset pattern (no boning) and modified it slightly. 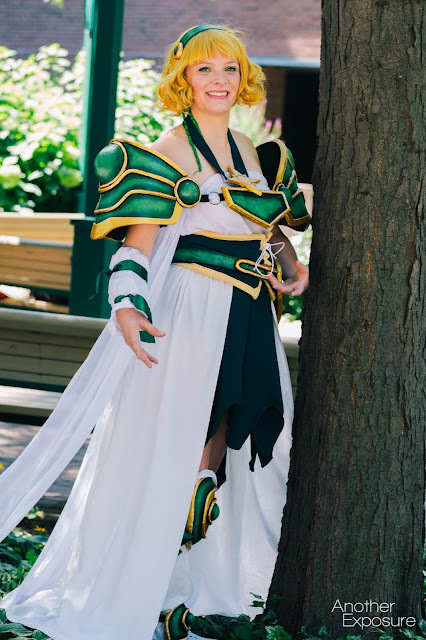 In hindsight I would not make the cincher out of fabric again as the edge where the eyelets had to go was so thick from the layers of material that I had to glue them in place. Skirt - The skirt was made by taking circle skirt pattern and modifying it to have an eliptical shape, with the opening off center. I cut into the hem to form the ragged edge and each edge was narrow hemmed. A zipper and waistband was used to form the opening. 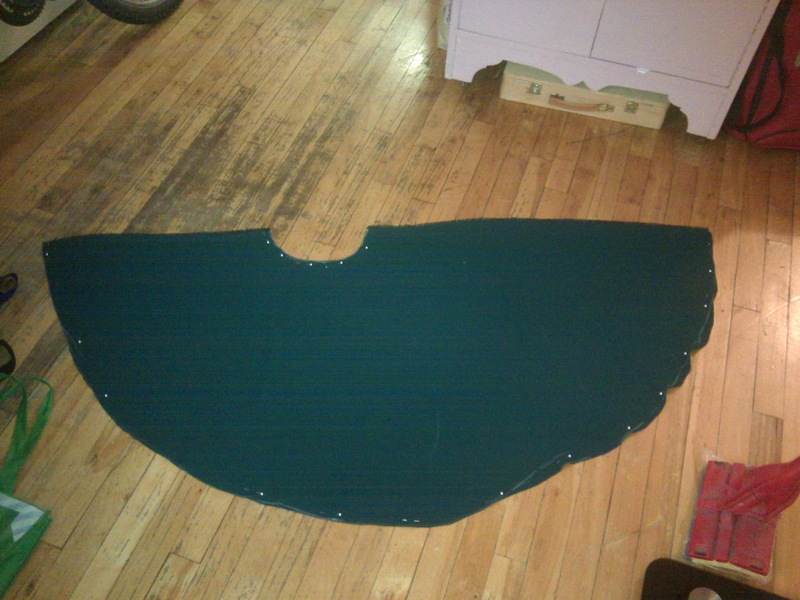 Over Skirt - This was probably the easiest thing to make for this costume. I took an old bed sheet, bleached it and used nearly the whole piece for the fabric of the over skirt. 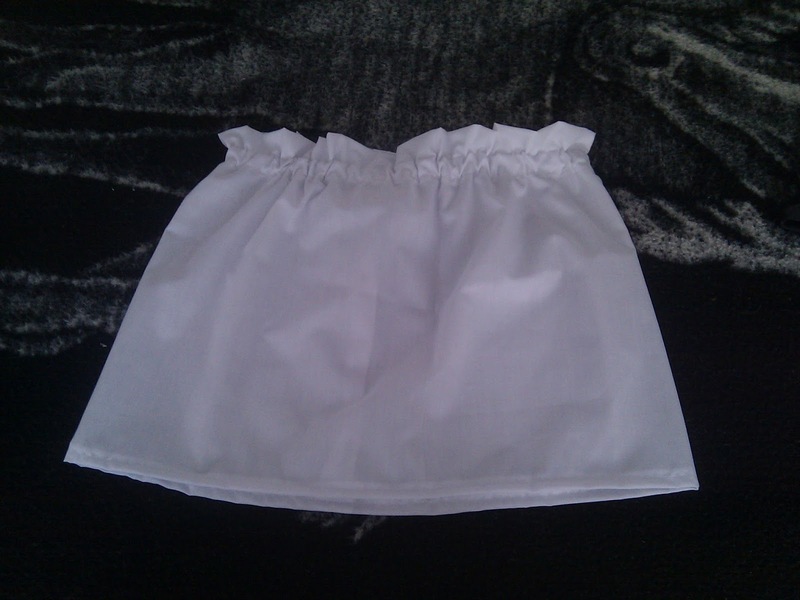 It was sewn onto an elastic waist band leaving a six inch gap at the front to allow the skirt to poke through. Hardly any hemming was required as I tried to maximize the use of the already finished hems from the bed sheet. Armband - The armband was made by simply making a cylinder out of fabric larger than my forearm and adding an elastic hem at the wrist end. The green ribbons were sewn onto the back of the armband. Boot Covers - Since the source image didn't show what kind of boots she was wearing, I had to improvise what I thought would be on her legs and feet. I settled on an asymmetric boot cover design where one boot cover extended slightly past her knee and the other hovered around ankle height, Both boot covers were made using a slightly tampered cylinder of fabric of different lengths. 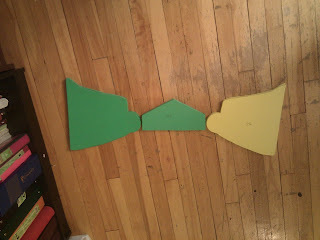 The taller one also had a green ribbon sewn into the top as an embellishment. Armour - Most of the effort that went into this costume was focused on the armour portions. The were ankle pieces and pauldrons, a hip plate and a knee cover. 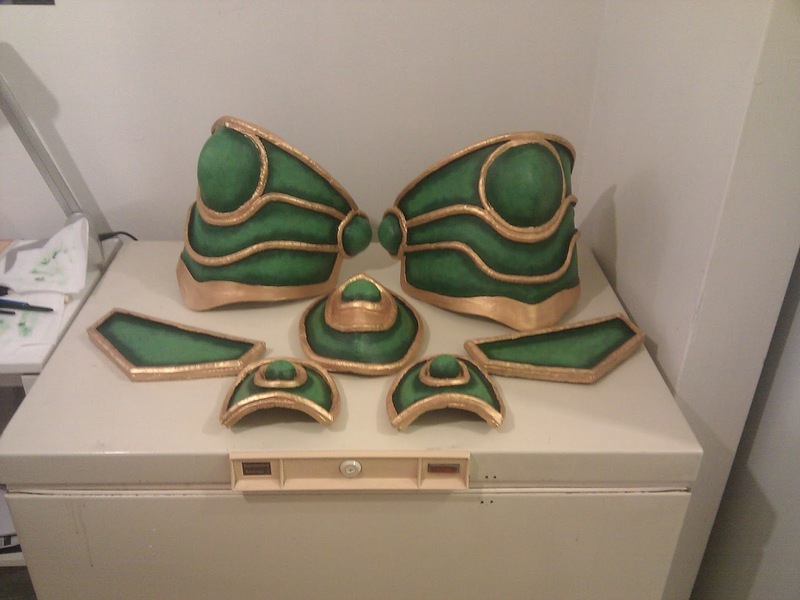 All the armour was made using EVA foam with acrylic paint. I decided to make the pauldrons "float" as they seem to not be supported by her shoulders at all in the source artwork. I also magnified their size to emphasize the unrealistic proportions that Clamp loves to use in their art. In order to create the floating illusion, I made the pauldron into two parts, the inner band that wrapped around my arms and the outer shell. The outer shell was supported by a series of "bones" that connected the floating piece to the armband. 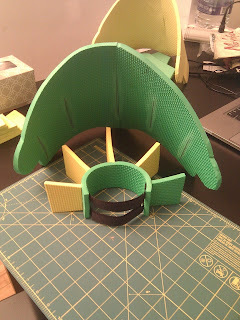 I don't know how feasible this method would work in other materials but because of the lightness of the foam, the pauldron stayed up and didn't fall down my arm. The hip piece was simpler to make and consisted of a curved elliptical piece and two strips that acted as the belt. The knee pad and ankle pieces were designed using simple shapes namely a curved ellipse and two half circles. All the details were made using EVA foam and Styrofoam balls. The armour pieces were primed with Gesso, then painted with a base coat of black before adding the colour, shadows and highlights using the dry brush method. The paint job was sealed using a modge podge acrylic spray sealer. Wig - I used my original howl wig as a base to style Fuu's wig. 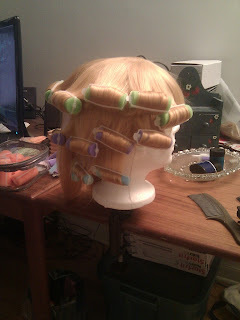 The wig was bought from Arda Wigs in the Inigo style in light blonde. To get Fuu's adorable curls, I sectioned the hair into curlers and used boiling water to set the fibers. I soaked it before letting it dry overnight. Once the curling process was done I actually had to loosen the curls with a comb to get the flowy hair she has in the anime. Sword - The sword is currently in progress.